Go to the Author Central Books tab and click Add more books. Once you've found the missing book, click This is my book below that book. If our catalog lists your name as the author, you're all done. It can take up to 5 days for books to appear in Author Central. The order of books is determined by a book’s relevance, the same way your books appear on the Amazon.com Author Page. The most popular books, based on a set of rules designed to provide the best customer experience, appear near the top of the list. We cannot change the order. 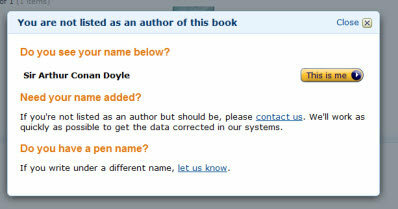 Remember that customers can sort books in several different orders on the Author Page. You can also optimize your book's search results. If you contributed to an Anthology and would like to claim the book to your Bibliography, please ensure that you have joined Author Central and completed the registration process. Send us verification that you have contributed to the book, such as a link to your publisher's website or a table of contents which clearly lists your name. Go to the "Books" tab located on the top of the page. Search for book written by [PEN Name], by title, author, or ISBN. Click This is my book. Once we verify with the book publishers that you're an author of the book(s), an additional Author Page will be available for you to maintain. You can get to your pen name through the link in the upper right corner of Author Central. You can manage two or more Author Pages this way. They will not be associated in any way on Amazon.com.